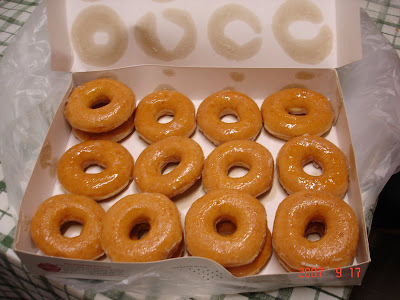 Me, Editor, recently got a special souvenier by 'mua' bro, a lovely box of 24 Krispy Kreme...(After several pressure putting and nagging..) from melbourne. I would say, it's the best souvenier yet from my bro. Every afternoon, i would have 1/2 hour of KK time. Where i get a cup of tea, sit down and have 2 doughnuts. What a life~~!! A bit sweet for my taste, but the texture is superb. It's soft but not too soft, and when u take the bite, it will just melt away in your mouth. (M&Ms-melt in your mouth, not in your hands) Thanks to Mr A, we have a small demonstration the sacrifice needed to be make to eat the doughnut-being photographed. Thanks Mr A.
it is sweet but not too sweet, it is soft and yet not too soft. 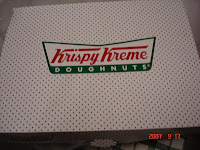 it is the best doughnut i had in WA since i came, although i only tried 3 different shops. kakaka! 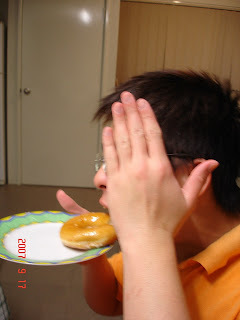 from lookin at the picture, Mr.A already tells that the doughnut is freaking delicious, coz his month is opennin widely and cant wait to take a bite on the doughnut. hahaha! it is stupidgoat that leave the msg previously. not familiar with blog thing. kakaka! then can i get ur schedule? ?